These vegan meatballs are crispy on the outside, tender on the inside, and seasoned with Italian herbs. 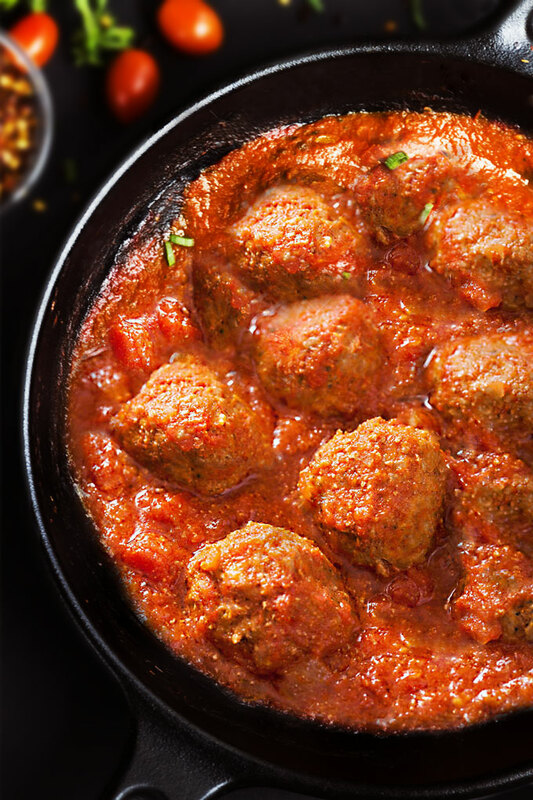 Served over over spaghetti with herb-infused tomato sauce, these “meatballs” will leave you not only full, but also feeling wonderfully satisfied. Several years ago, before I became a mom, I worked out religiously every day, sometimes even twice a day. As a fitness instructor and a personal trainer, I always felt that I needed to be in a better shape than any of my clients. I thought that a thought will run through the head of any potential client who sets eyes on an out-of-shape trainer – if what she has to offer is effective, why can’t she implement it herself? The fitness industry can often have this underlying pressure of “you must always look better than your client”. So I worked out like a crazy person. I also tracked everything I ate, counted calories, and refused to eat any comfort foods, meatballs with pasta and tomato sauce included. So silly but that’s how it was. I still work as a fitness instructor, but I am much more relaxed about my fitness routine and eating habits. I now enjoy vegan meatballs and other comfort foods on a regular basis although I am still very conscious about how nutritious my meals are. BTW, is it offending to you that I call these meatless veggie balls “meatballs”? I know that the term vegan meatballs is rather controversial. I’ve seen a lot of people get upset by the use of meat-related words when referring to plant-based foods. It probably doesn’t make a lot of sense to call something that’s meatless meat. But what else would you call them? Anyway, here are my few tips for making these vegan meatballs. You might be wondering – do these vegan meatballs taste exactly like meatballs? I would say they do not because, well, they aren’t meat. But they have a very meaty flavor, which is exactly what I was after. I do have to say that the texture isn’t as chewy as you would expect from traditional meatballs. These meatballs are crispy and firm on the outside, tender on the inside, and won’t fall apart when you stick your fork into them. But they don’t have much elasticity to them. The base of these vegan meatballs consists of tempeh, which is made by fermenting cooked soy beans. Tempeh is a great meat substitute because it absorbs other flavors quickly, has a mild, nutty flavor with a chewy, dense texture. It also crumbles easily, so it’s perfect to use in place of minced meat in any recipe. Next ingredient on the list are mushrooms. Mushrooms are rich in glutamates, which provide an umami (savory) taste to food. If you’re not a fan of mushrooms, you can just leave them out. What I wouldn’t skip though are the onions and garlic. These aromatic vegetables bring out the savory qualities of the other ingredients they are cooked with. As far as texture of these vegan meatballs goes, ground seeds work really well here because they mimic the behavior of cooked ground meat. My favorite are sunflower seeds, which have a bite to them, but soften just enough after cooking that they’re still tender. If you’re allergic to nuts/seeds, I would suggest using some cooked brown rice (as I did in these veggie burgers) or some cooked quinoa to add a little bit of “springiness”. For a vegan “egg”, flax seed eggs work perfectly in this recipe to bind the meatball together. A flax seed egg is simply made by mixing water & ground flax. It gels up similar to egg texture and works great in many recipes as a binder. Finally, the nutritional yeast helps absorb some of the moisture and also adds a bit of a cheesy flavor. Pan-fry the tempeh with a little bit of soy sauce until it’s brown and crispy on the edges. Boil it in salted water for about 15 minutes, drain, and marinade it overnight. To achieve some textural variation in these meatballs, make sure that you don’t over-process the ingredients. When pulsing the tempeh, use the pulse button only a few times. The tempeh doesn’t have to be completely broken down. The same goes for the other ingredients – pulse all the ingredients only to the point that everything is well combined but not mushy. When it comes to the cooking method, I’ve done all kinds of testing. My favorite method is air-frying. Other cooking methods, such as pan-frying or baking also work, but not so well. However, I have done these 100% in the oven with great results. You obviously don’t get the crispy, crunchy outside crust, but you still get a really great meatball. These vegan meatballs are crispy on the outside, tender on the inside, and seasoned with Italian herbs. 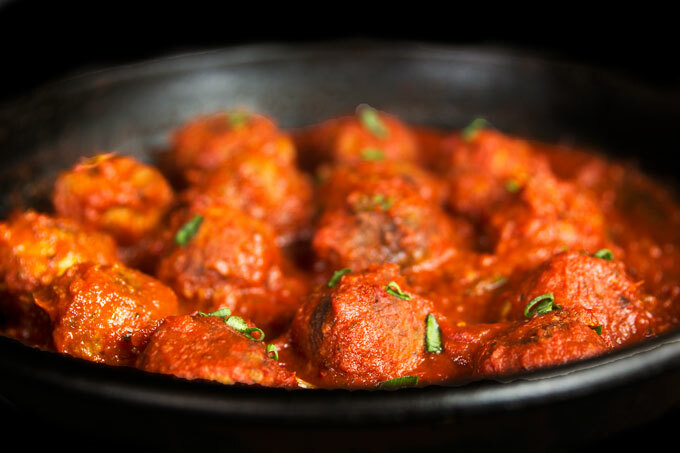 Served over over spaghetti with herb-infused tomato sauce, these "meatballs" will leave you not only full, but also feeling wonderfully satisfied. Preheat airfryer or oven to 375°F (190°C) and prepare flax egg in a small dish. Heat a skillet over medium heat. Once hot, add tempeh and soy sauce, Brown the tempeh for a few minutes. (You might need to add a little bit of olive oil to the pan so the tempeh doesn't stick). In the meantime, add sunflower seeds to the food processor and pulse until coarsely chopped. Then add the browned tempeh to the food processor and pulse it a few times to breaks down. In the same skillet that the tempeh was browning, heat 1 Tbsp, (15 ml) of oil over medium-high heat. Add the onions and garlic and sweat them out for about 3 minutes, until translucent and fragrant. Then add mushrooms and a pinch of sea salt. When the mushrooms start releasing water, add the dried oregano, basil, and black pepper. Keep sauteing until all the liquid from mushrooms evaporates. Add sautéd garlic, onion, mushrooms, and all the other ingredients (flax egg, breadcrumbs, and nutritional yeast) to the food processor with sunflower seeds and tempeh, and pulse a few times until all the ingredients are well combined. Taste and adjust seasonings as needed. The tempeh will come across as a little bitter, but once baked, it should be far less apparent. Scoop out 1-2 Tbsp of dough and roll into balls. If using airfryer, place the meatballs in the airfryer basket and slide the basket in the airfryer. Air-fry for 15 minutes or until crispy and golden brown., If using oven, place the balls onto a baking sheet lined with a piece of parchment paper. Bake for 25-30 minutes or until golden brown and crispy. If you pan-fried the meatballs first, you'll only need to bake them for about 15 minutes. 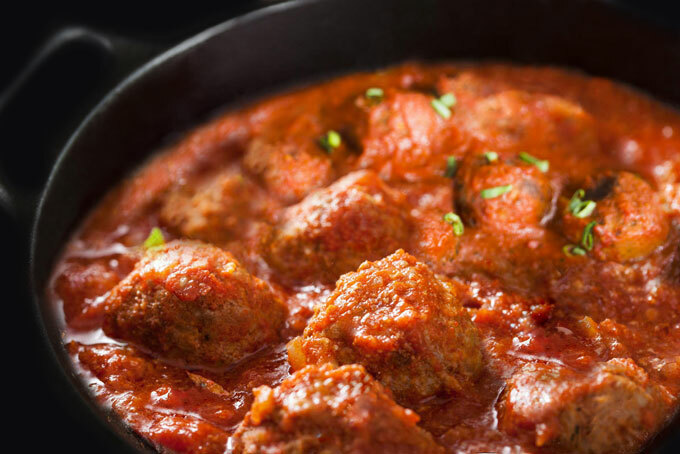 At this time, prepare the tomato sauce and any pasta your want to serve the meatballs with. In a medium-sized saucepan, heat the oil over medium-high heat. Add the garlic, bay leaf, and red chili pepper flakes and sauté for about 1 minute. Add the tomatoes (or tomato sauce) and simmer for 30 minutes. When the tomatoes begin to break down, coarsely crush them using a potato masher. Season with salt and black pepper. 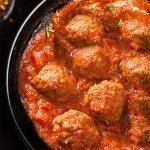 Place the meatballs in the tomato sauce, cover and cook for 10 minutes over medium-low heat, turning them a few times during cooking. Serve meatballs and tomato sauce over pasta or with fresh bread. Store leftover meatballs with sauce covered in the refrigerator for a few days, though best when fresh. *You can make flax egg by mixing 1 Tbsp. (7 g) flaxseed meal with 2.5 Tbsp. (37.5 ml) water. I have been looking all over for a meatball – loaf/burger recipe. All of them break apart too easily when flipping. What is your experience with this recipe? Can they handle a grill – if flattened and turned into burgers? I find that so many burgers barely brown and then are just mush on the inside. If you have come across this…how have you corrected it? That being said…could I replace the Tempeh with Brown Rice – I’m assuming you’re using it as a binder too? Petra, I would like love to tell you that I finally got around making your recipe one month after you emailed it to me. I gotta tell you, it turned out tasty, even though I made some mistakes and some funny mishaps. I over processed the meatballs which made them a bit mushy (I’m new to veganism and it’s the first time ever making vegan meat). As for the tomato sauce, I was unable to open the store bought jars (I had no one to help me out), so I just grabbed all the tomatoes I had and put them on a blender and puréed them instead. It turned out well at the end in terms of taste and filling. I’m planning on making them again now that I got a bit of practice. All the best for you, Tanner, and your little one. Petra, thanks for the reply. I’m glad to know I’m not alone in struggling with opening tomato sauce jars. Looks like I’m gonna have to keep making veggie meats until I get the hang of it haha. Congratulations on your other little one that is about to arrive. 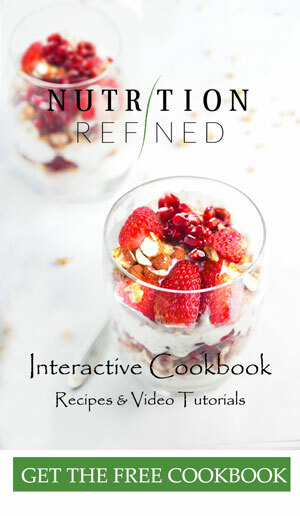 If I choose to substitute the tempeh for chickpeas (as you mentioned I could do in the video), how should I prepare the chickpeas and how much should I use?